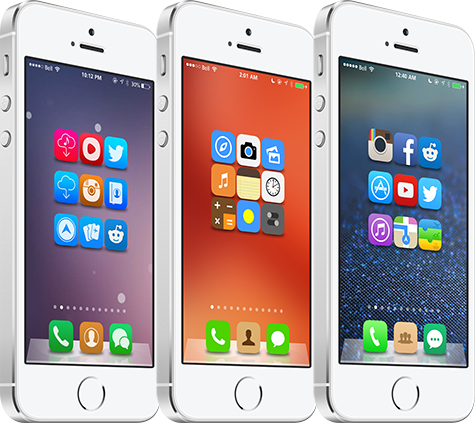 This fifth edition of Theme Thursday marks one month since we began highlighting some of the best Winterboard themes available for iPhone and iPod touch. It has been a lot of fun putting this column together each week, and I’m glad that so many readers have been enjoying it. iPad users, your roundup is on the horizon. To achieve the overall setup of my Home screen, I have switched to a 3×3 sparse icon layout using Iconoclasm. IconOmatic was then used to remove the app icon labels and apply a shadow underneath the icons. Both jailbreak tweaks are available on Cydia. On a related note, HomescreenDesigner is another good option for customizing your Home screen setup. While I don’t think this theme is as groundbreaking as advertised, Axla offers a refined set of custom icons that are designed with both simplicity and depth. 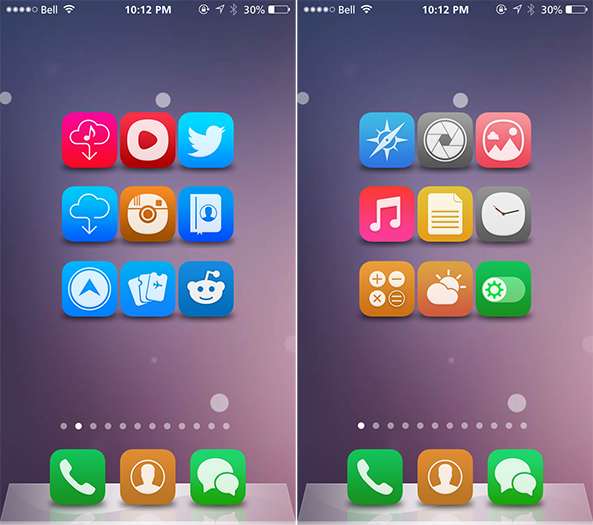 The theme has a vibrant color palette and support for a wide variety of stock, third-party and jailbreak apps. What’s even better is that non-themed icons blend right in for the most part, making the wait for additional icon requests less painful. Axla, the work of iOS designer Meteochu, comes with both a default mask and circle mask that can be enabled optionally through WinterBoard. The theme’s official description claims that it makes subtle changes to the user interface, although I haven’t noticed a single difference systemwide. I would like to see the number of icons grow past the 110 included, but otherwise have nothing bad to say about this theme. $1.00 on the Cydia Store. 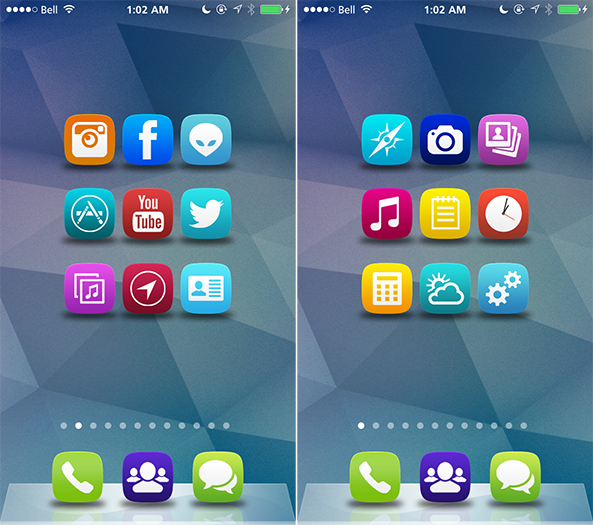 Sebastien shared this theme with me last week, and I’m not sure why I didn’t feature it sooner. 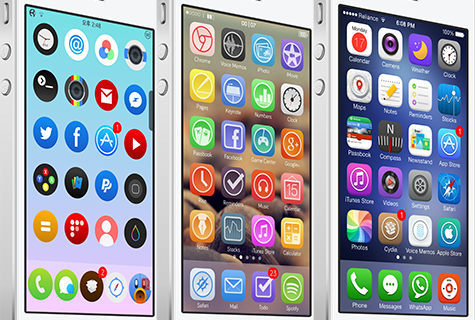 iOS 8 Concept by EverythingApplesPro takes the iOS 7 icons and gives them a well-designed makeover, but the theme is restricted to mostly stock apps. Many third-party apps that I installed from the App Store do not have custom icons, which is the major downside of using most themes in general. Just like with Axla, I would like to see more icons added to this theme. In the meantime, it is free on Cydia in the BigBoss repository. 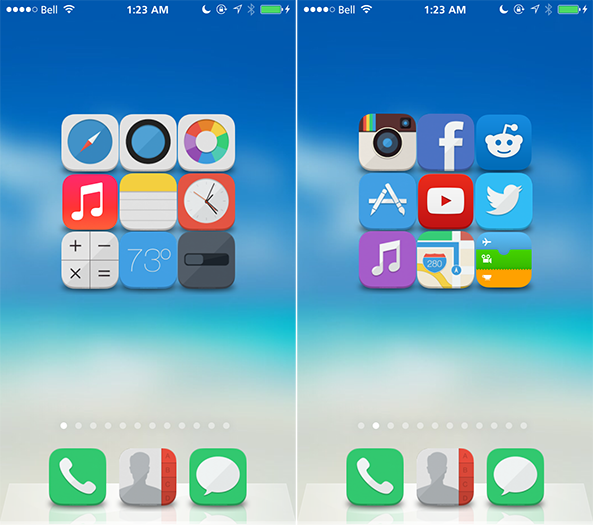 Another theme that should have made Theme Thursday already is FlatIcons, one of the most popular minimalistic themes for iPhone. The single biggest draw to this theme is that it has over 500 custom icons and counting, obliterating the total icon counts of possibly any theme not named Jaku. And with multiple icon masks that can be enabled through Winterboard, the theme can be further customized to your liking. FlatIcons icons are said to be carefully drawn by hand and optimized for the Retina display, and that level of detail is highly evident. Better yet, the designers of this theme are committed to fulfilling icon requests through the FlatIcons website. I can only imagine that FlatIcons for iOS 7 will one day eclipse the whopping 1150 icons that are bundled with the iOS 6 version. 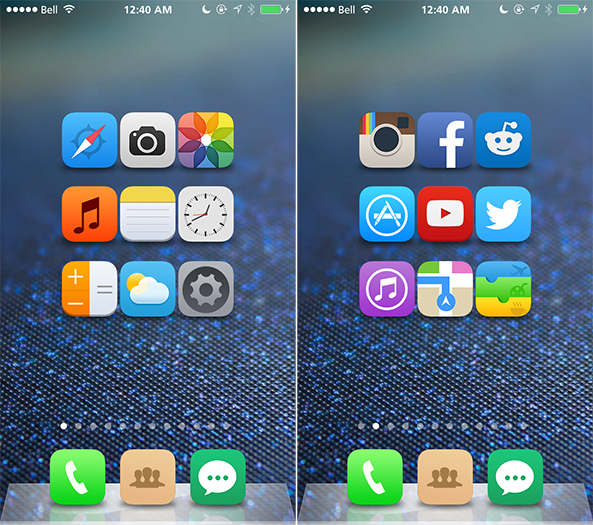 FlatIcons iOS7 is a dollar well spent on the Cydia Store. The icon masking for this theme reminds me of Soft Remix, although I have to say that the latter theme remains far superior in design. 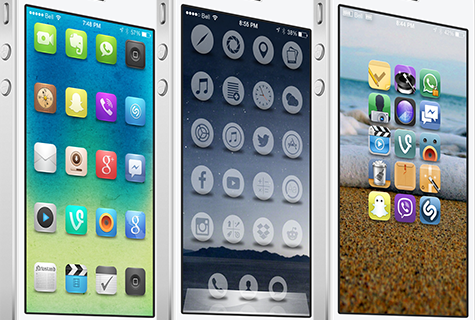 Nevertheless, Ryne Braun‘s Gusht is a decent alternative to stock iOS 7 and has over 200 custom icons and growing. Now if only we could get more graphic designers to focus on themes that aren’t simply white glyphs slapped on an icon, like Jaku or Laguna. But if this is your style, Gusht will set you back a dollar on the Cydia Store for iPhone. I’m not sure why so many themes are using iOS 8 nomenclature, but the iOS 8 Infinity Theme is worth mentioning regardless of its name. I am a big fan of themes that have icons with contoured edges, and iOS 8 Infinity executes that design perfectly. I’m not sure why the Music app doesn’t have a custom icon, considering it is one of the main stock apps, but the theme does support a wide variety of apps overall. iOS 8 Infinity took over three months to be completed by Russian graphic designer Nico Achkasov, and was intended to make Apple rethink its own icon design. It is said to follow a specific color palette and same grid system that the Cupertino-based company uses, albeit in a more consistent and harmonious manner. 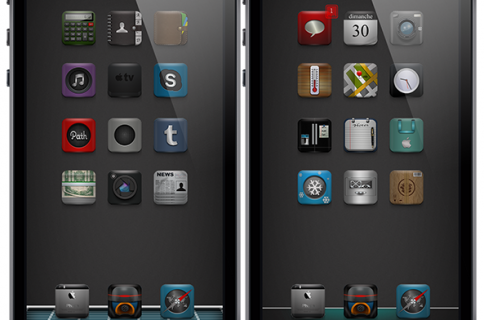 If it suits you, the theme can be found on Cydia for free in the default ZodTTD repository. Thank you to the readers that have contributed theme recommendations for this column over the past month. I encourage you to continue doing so in the comments section down under. If you happen to design themes yourself, you can gift your work to Cydia ID 6107077 for potential coverage. I recommend reaching out to me on Twitter (@rsgnl) to connect as well. I will be leaving on a trip to Montréal just as this roundup is published, but I will be sure to have Tweetbot by my side.